Cases where our LED Grow-lights improved crop yields. These are the test results for replacing a 400W HPS lamp, with EconoLux's 200W PRO-LED light (since discontinued and replaced with the more compact and lighter weight PRO-LED-100TM lights) in an indoor grow tent setting. The 200W of McCree curve lights gave about a 16% increase in Buds with a more than 50% reduction in energy costs. 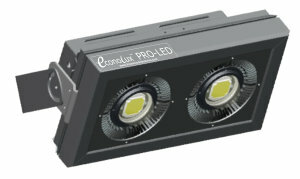 LIGHT: The test grow light was one of the original PRO-LED 200W lights, that was equipped with two units of EconoLux ELPL-Mc-100W COBs, with a 94% match to the McCree curve, and 90 degree lenses. This model was discontinued as it was heavier and bulkier than using two PRO-LED-100W units. SPECTRUM: The spectrum of the 200W light is essential the same as the the MC COBS, since the light uses two pieces of ELPL 100W MC COBs. 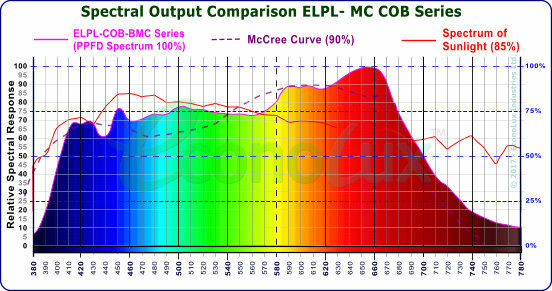 Note that the spectrum is a close match to the McCree curve, which is sown at 90% on the graph. The spectrum is also a reasonably close match to the spectrum of natural sunlight, at 80% to 85%. The spectrum of this light, and the PRO-LED-100W lights is a "general purpose" spectrum, good for cultivating all types of plants. TEST CROP: Cannabis plants, grown in a 1 X 1,2 meter grow-tent, indoors. The photo (on left below) shows the early stages of the test grow, while the photos (in the middle and on the right below) show the later stages of the grow test just as the plants are starting to flower. RESULTS: The Cannabis plants produced about 16% more buds in the same time period as the previous grow under a 400W HPS lamp. The grow consumed less that 50% of the power used before, and the temperature inside the grow tent was also lower than with the HPS lamps, saving on the fans and ducting needed to cool the HPS lamp. Below are some photos of the harvest from this test grow. On the left is a close-up one one of the buds, in the center is the harvest being trimmed, and on the right is the final weight of the trimmed harvest (45.56gr). NOTE: Growing Cannabis in France is still illegal, which is why we have not identified the grower.